I once received an email from a reader who wanted to know why I had reviewed “a corny old movie nobody is interested in” like the 1966 BATMAN instead of reviewing the Tim Burton version. The reader went on to suggest that if I wanted people to read my reviews, I should spend more time reviewing “movies people want to see” instead of “all that old crap”. I sent the reader a pleasant enough response, informing him that the reason I was doing this was to review movies I liked and the movies I like cover an enormous expanse of territory and I don’t like to limit myself to whatever happens to be the hottest movie in the Cineplex this weekend. J. Pierpont Finch is a window washer filled with ambition and bursting to make his mark in the business world. One day he picks up a book entitled “How To Succeed In Business Without Really Trying” and armed with the advice the book provides, starts a meteoric rise from mail room clerk to Chairman Of The Board Of World Wide Wickets, a company so huge that nobody is sure of exactly just what a wicket is. Finch is helped along his climb up the corporate ladder by Rosemary Pilkington, a secretary who is convinced Finch needs her help and tries her best to get him to see how much she loves him but Finch is too interested in brown-nosing the top executives or pulling underhanded tricks to get promotions. Finch’s main rival is Bud Frump, the nephew of J.B. Biggley, President of World Wide Wickets and much of the movie has Finch and Bud trying to double-cross and backstab each other while they jockey for promotions that quite frankly neither one of them deserve. Now, when I lay out the story like that, you would think that it sounds like a pretty grim story of corporate greed and bitter rivalry. But remember, this is a ‘60’s musical we’re talking about. Everything is in glorious Technicolor and the songs are big, beautiful numbers with lots of lavish dancing (the original choreography was done by Bob Fosse) There’s a ton of laughs as Finch charms and bullshits his way around the company, making friends through song and dance and seeming to extricate himself from one crisis after another with a cheerful, gap-toothed grin. I like the cast in this musical a lot. Robert Morse plays J. Pierpont Finch with loads of energy and vitality. He’s one of the few actors to have won a Tony for both a musical role as well as a dramatic one playing Truman Capote on Broadway. If you only know Robert Morse from “Mad Men” you really ought to see this one when he was in his incandescent prime. Watching him in this movie, he reminded me a lot of a ‘60’s version of Michael J. Fox. He may be playing a sneaky, manipulative double-crossing weasel with two faces and a forked tongue in both of them but dammit, he makes us like J. Pierpont Finch and we find ourselves rooting for him. Michelle Lee is endearing as Rosemary Pilkington and she gets to sing the big romantic number ‘I Believe In You’. Rudy Vallee is J.B. Biggley and there are a lot of funny bits with him and Morse as Morse worms his way deeper and deeper into his confidence. A lot of the humor in the movie comes from Anthony Teague as Bud Frump, who looks like he could be James Coburn’s sneaky kid brother and Maureen Arthur as Hedy LaRue, the cigarette girl who blackmails J.B. Biggley into giving her a job at World Wide Wickets. Maureen Arthur is hilarious playing a drop-dead gorgeous bimbo who is hopeless at anything else except for Finch using her as a lure to trap other company executives into situations where they’re caught with her by J.B. and summarily shipped off to Venezuela. And as for the songs, I like ‘em all and much as I like musicals, I find that there’s one or two clunkers except for this one and “Guys And Dolls” where I look forward to each and every number. Especially the show-stopping ‘Brotherhood of Man’ number near the end. It’s probably no coincidence that both musicals had songs written by the same man, Frank Loesser. By the time it’s all over, Finch has achieved his goal of rising to the top (and if I’ve counted right, it only took him six days…allegory anyone?) married Rosemary and even made friends with Bud Frump and the last scene of the movie shows that Finch has set his sights even higher. 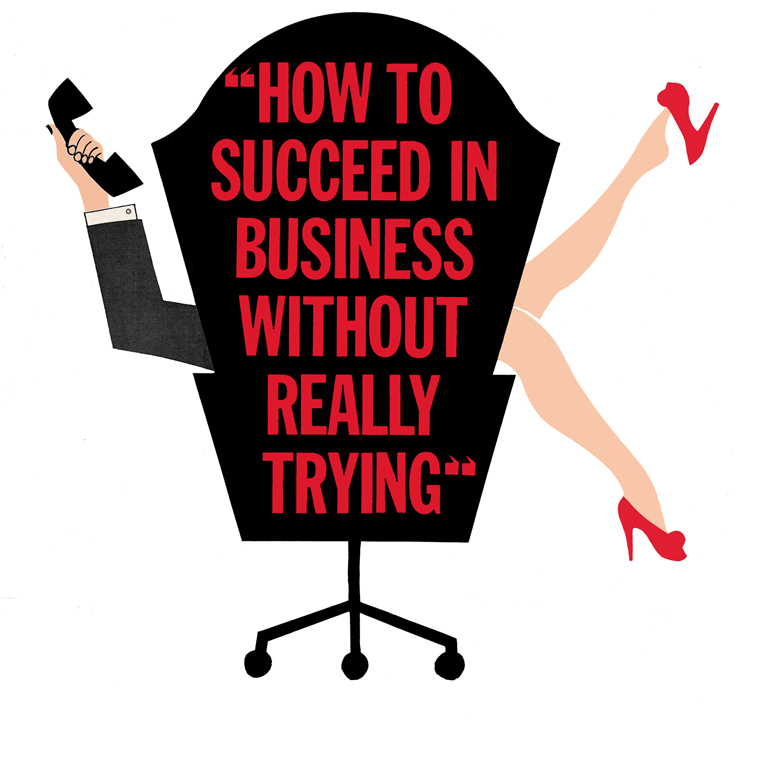 HOW TO SUCCEED IN BUSINESS WITHOUT REALLY TRYING probably looks clunky, old-fashioned and plodding to modern day audiences who insist on more razzle-dazzle and music video style editing in their movies nowadays. But this was a musical that was made when they knew how to film one so that you could see that it was the actual person you paid to see singing and dancing actually doing it. It’s a movie musical that has nothing but charm, good songs, good performances and a lot of laughs. It demands no more from you that you sit back and let yourself be entertained. Trying to remember the name of that weekly musical comedy series on TV Robert Morse was part of…it was pretty good.